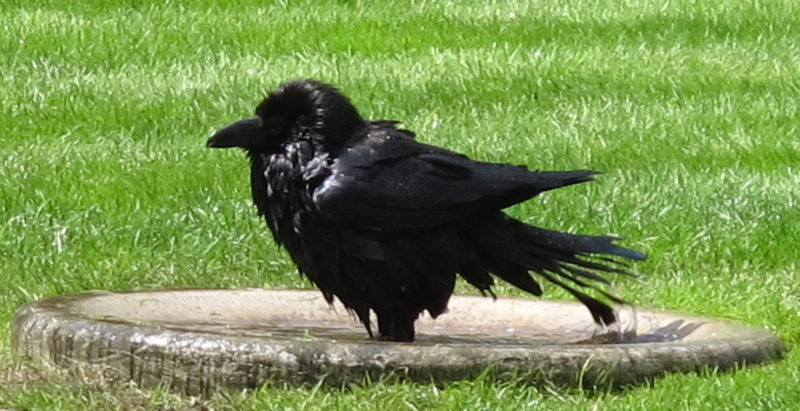 I learned about the Tower of London ravens as a small child. Should they ever leave the Tower something terrible would befall the nation. I’ve always wanted to see them and this week I had my chance. Even better the sun shone. On my return home I dug out my London Lore by Steve Roud – an excellent book I might add- and got ready to research this blog post. To my horror I discovered that the ‘fact’ that I’ve known for as long as I’ve known about the Tower is in actual fact a tall story put around by the Victorians. I don’t suppose I should grumble too much . They did considerable restoration work on the tower and launched it as a tourist attraction. So – I thought they’d been in residence for the last nine hundred or so years. Certainly, that’s what the nice Beefeater, sorry – Yeoman of the Guard- told the group of assorted tourists during his very entertaining talk. Roud, by contrast, reveals that it may have been Charles II who handed the first pair over into the care of the yeoman raven master but that it is more than likely that there were no ravens in the tower prior to the nineteenth century. Despite this rather disappointing discovery, a half hour watching a raven who knows how important he- or possibly she- is can only be described as a joy. This one, having dissected a privet hedge and strutted his- or her- stuff for an admiring audience lavished time and care on a bath in the sunshine. This entry was posted in Legends and tagged Charles II, ravens, superstition, the Victorians, Tower of London, Tower of London ravens by JuliaH. Bookmark the permalink. I saw the Tower and the ravens on a trip to London in 2008. I couldn’t get over how beautiful the birds are. They are well taken care of! They certainly are beautiful. I never realised that they were such good mimics either. Reblogged this on mackie abroad.